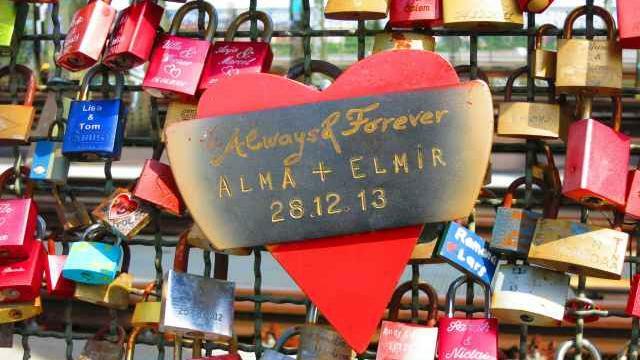 Get your own virtual Love Padlock! 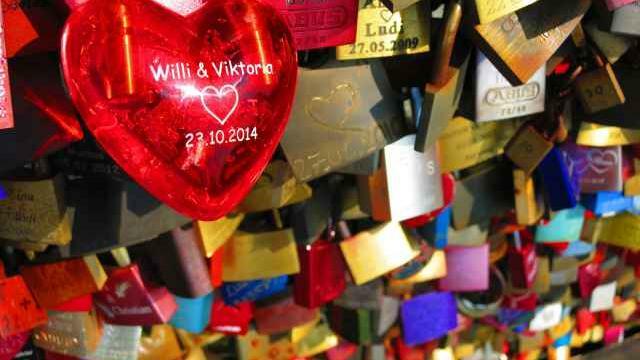 Get Your Virtual Love Lock! 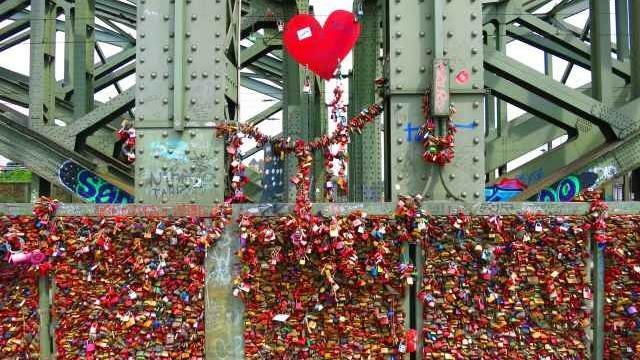 The picture below shows Cologne's Love Lock Bridge as a whole. 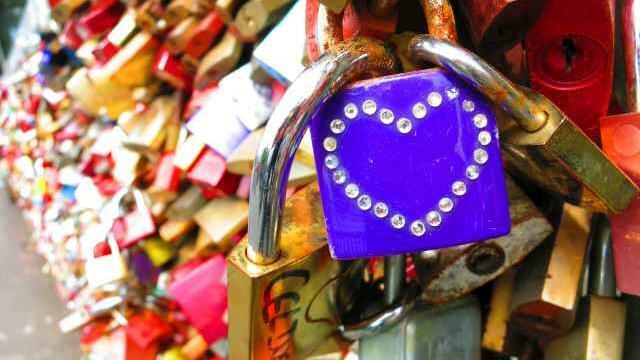 You can zoom in whereever you like, find the padlock of your choice and create your Virtual Love Lock. Just put in your names, your home town and if you like, a date which is special for you. 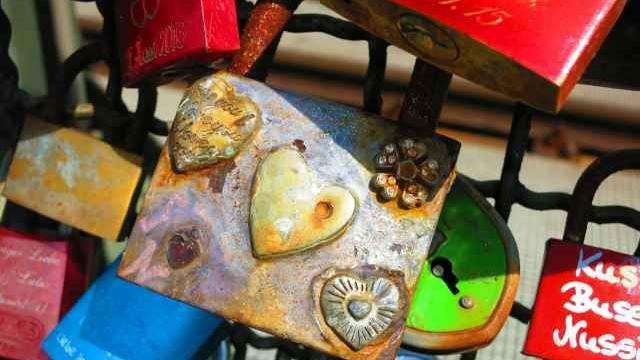 Not so long ago, padlocks became symbols of love. 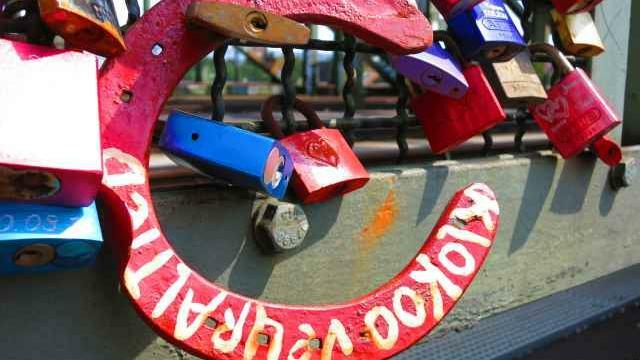 Lovers have attached them to bridges, gates, fences and similar public places. 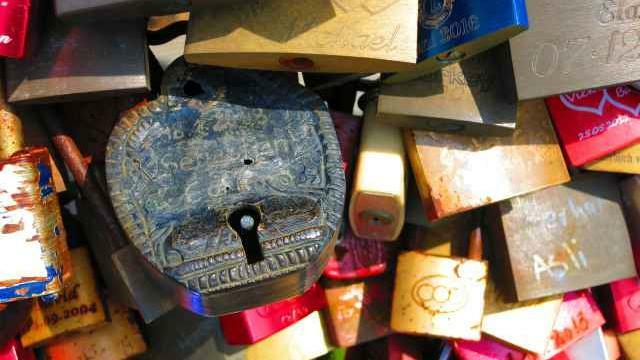 Often, the names or initials of the lovers are engraved and the key gets thrown away in order to demonstrate the indestructibility of the love between them. 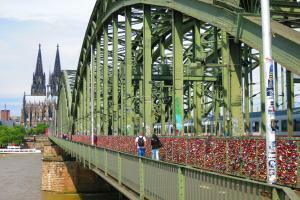 The keys of the love-locks attached to the Cologne Hohenzollern Bridge are thrown into the river Rhine below. 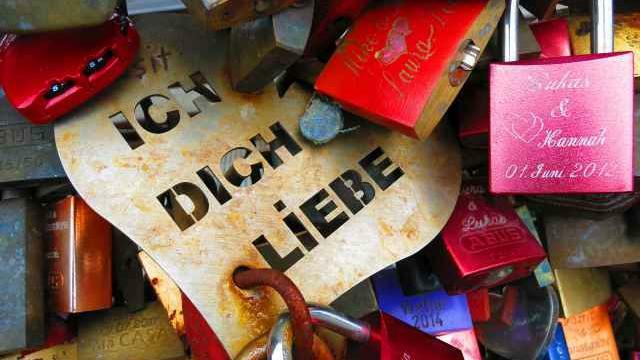 The Rhine, which traverses Germany, has seen millions of loving couples but keeps their secrets in its watery depths. 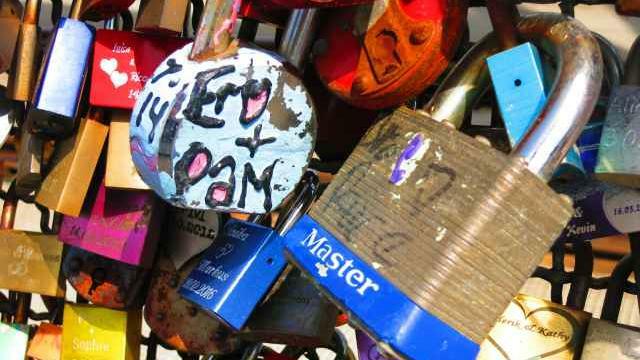 The custom to attach padlocks to the Cologne Love Lock Bridge - or Love Bridge, for short – began in the late summer of 2008. 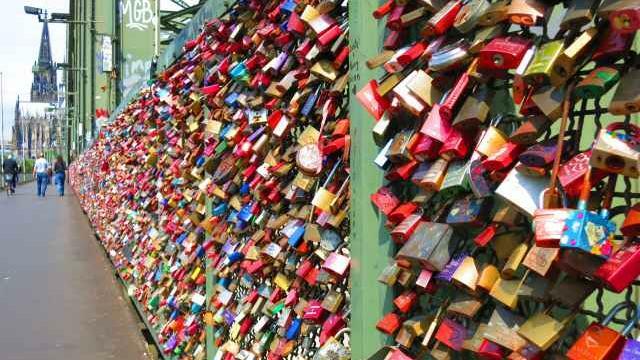 Since then, the number of locks has increased momentously. 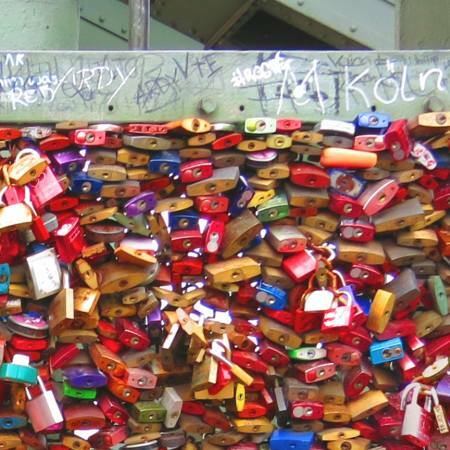 In 2011, 40,000 padlocks were counted, but today the number is likely to be 8 times higher. The bridge consists of 340 railing sections, which are similar to chain link fences and thus, provide an ideal space to attach padlocks. 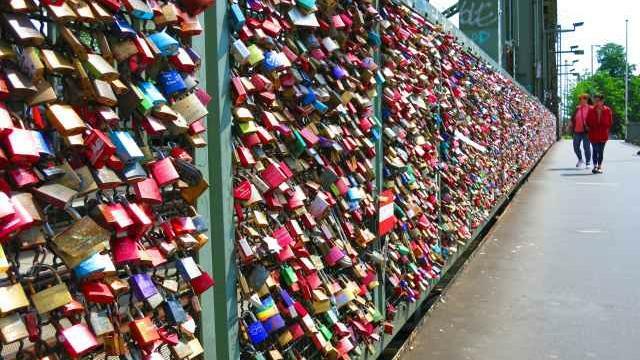 Each section has between 800 and 1,200 love-locks attached to it. 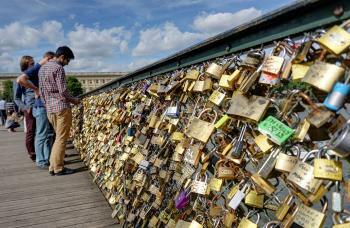 Therefore, a good estimate might be 340,000 padlocks in total. Along the southern footpath, free spaces can only be found in the last third of the bridge opposite the Cologne Cathedral. However, the northern footpath still offers lots of space for eternal love. 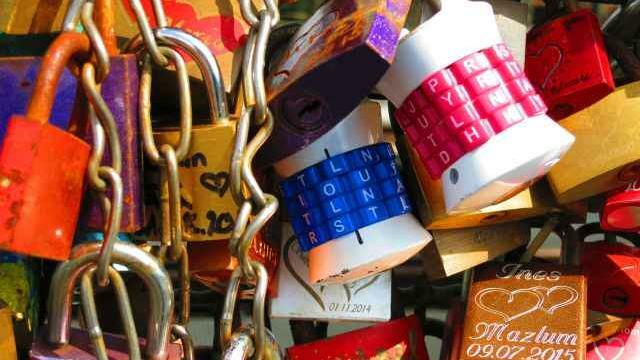 Where does the custom of attaching love-locks come from? One possible origin is Italy, the country of Amore and the tragic love of Romeo and Juliet. 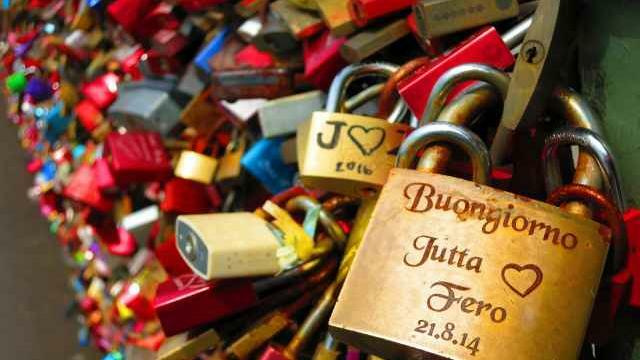 At one time, the graduate students at the University San Georgio, Florence, started to attach padlocks at the grid of the Ponte Vecchio Bridge. It was a vivid demonstration that they had completed their studies. 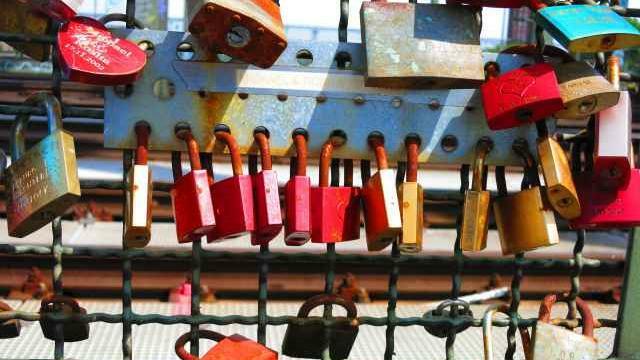 They used the padlocks of their University lockers. 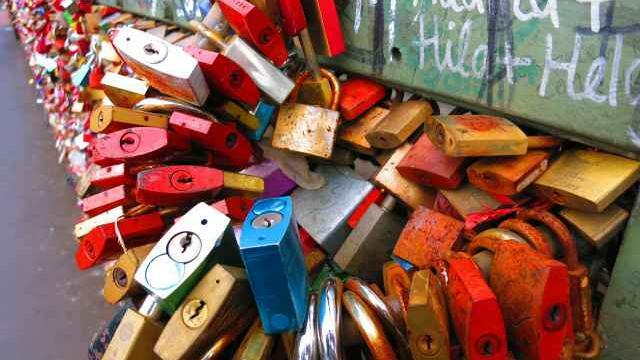 Later on, lovers continued this custom and attached padlocks to the Milvian Bridge. They threw the keys into the river Tiber to underline their infinite love. 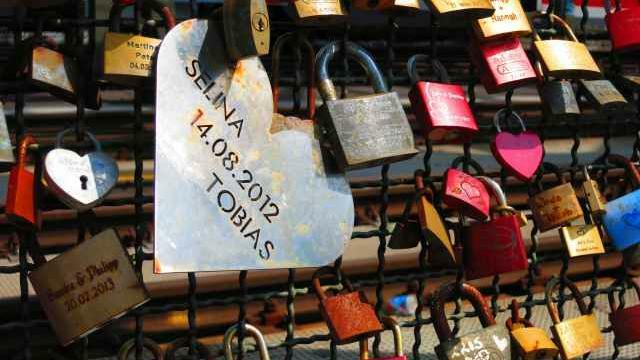 Another version of the love-lock origin story leads us to Serbia. 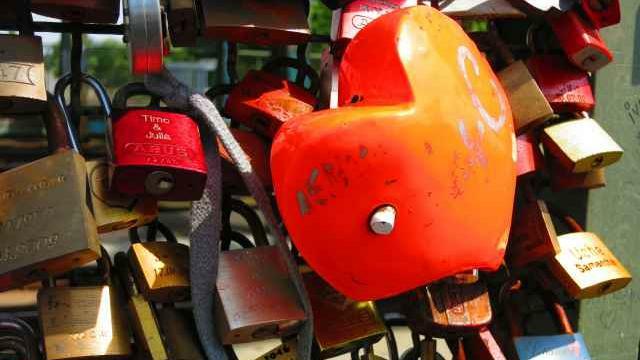 In the spa city of Vrnjačka Banja, there is a bridge called Most Ljubavi, which means Bridge of Love. The legend says that Nada, a teacher from Vrnjačka Banja, fell in love with the officer Relja. However, Relja had to leave Serbia to serve his country during World War One. Then, he found a new love on the island of Korfu and never returned. Deeply depressed, Nada died with a broken heart. 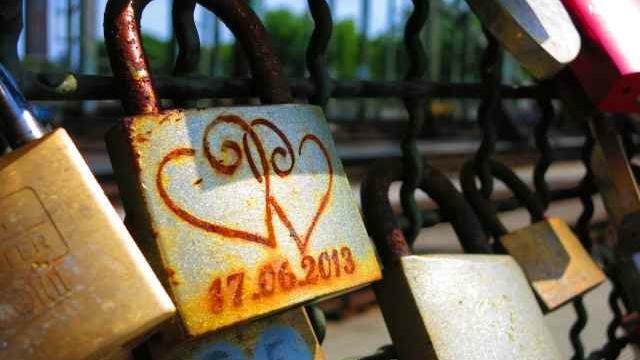 In order to prevent a similar fate, the women of Vrnjačka Banja started to engrave the name of their lovers on padlocks and attached them to the railing of Most Ljubavi Bridge - the place where Nada and Relja had once met. 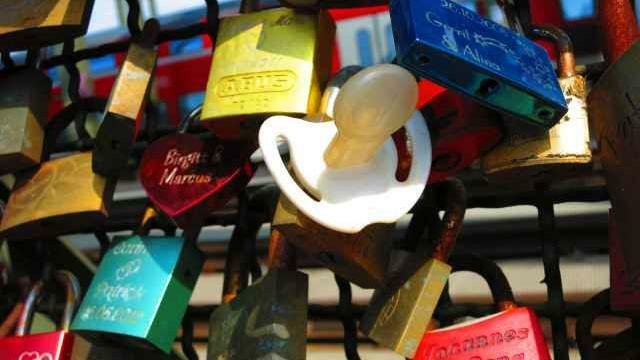 The custom of attaching padlocks to public sites is widely spread. The most knows sites can be found in Paris (Pont des Arts, Passerelle Léopold-Sédar-Senghor, Pont de l'Archevêché), Edinburgh (Forth Road Bridge), Albury, Australia, (Lake Hume), Ottawa, Canada (Corktown Footbridge), Bamberg, Germany (Kettenbrücke), Toowoomba, Australia, (Picnic Point) and a town called Lovelock, Nevada, USA (Lover's Lock Plaza). 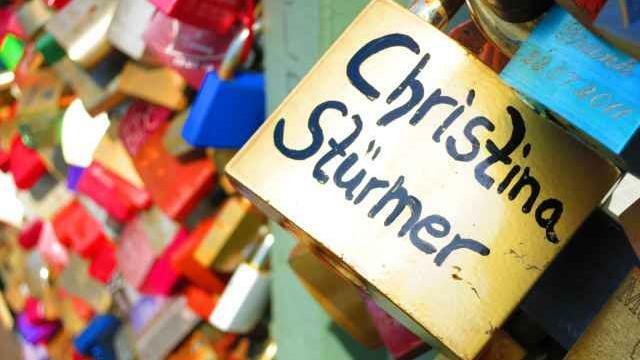 Local authorities show different reactions to padlock sites: mostly they are tolerated or even - like in Cologne - promoted to the status of a tourist attraction. 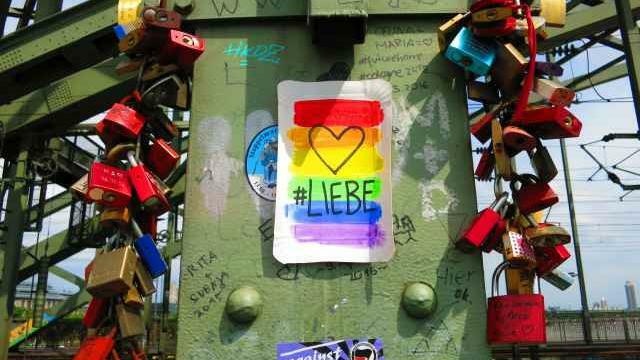 However, there are places where a huge amount of love locks is unwelcome and regarded as vandalism. 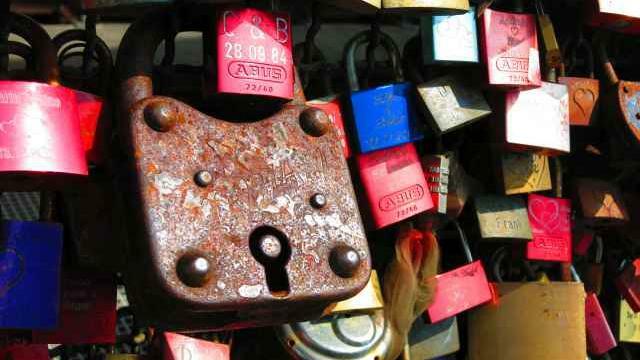 At many places, padlocks have been removed, mostely due to security reasons. 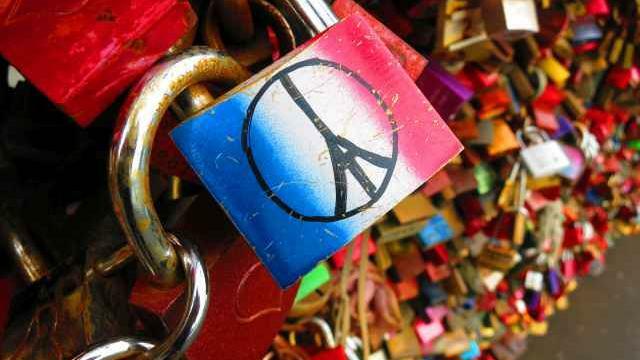 In September 2014, about one million padlocks (45 tons) were removed from the Pont des Arts, Paris after a part of the bridge's railing had broken down by the weight of the padlocks. 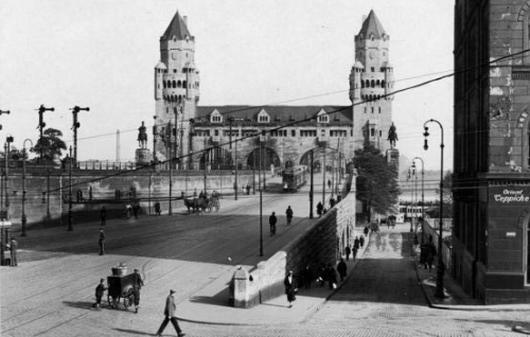 In order to create new traffic routes, the Hohenzollern Bridge began construction in 1907. Four years later it was proudly inaugurated by the German Emperor Wilhelm II. At that time, the bridge consisted of three parallel parts, each of them having three transverse arches to drive through. Two of them stretched over a pair of railway tracks, and the third one stretched over a street. 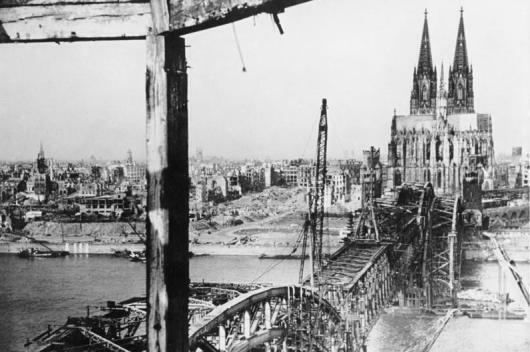 Shortly before World War II came to an end, the Hohenzollern Bridge was destroyed. Between 1948 and 1959 it was rebuilt with a different architecture. Only the railway tracks and two sidewalks have been reestablished. At each end of the bridge two statues of troopers were set up. They show Prussian Kings and Emperors of the Family of Hohenzollern. Today, Hohenzollern Bridge has a length of about 400 meters. 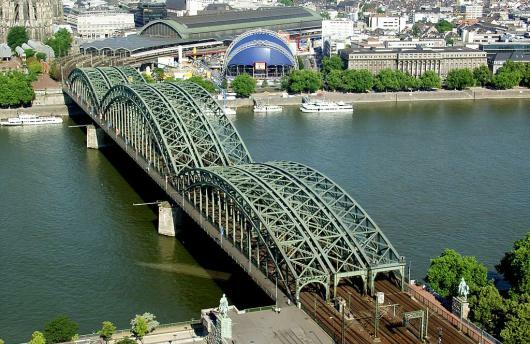 It is crossed by more than 1,200 trains each day and thus, it is one of the most used European railway bridges. 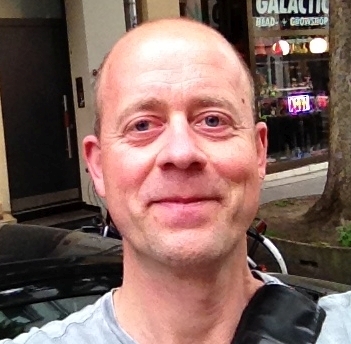 The photografic and artistic work of Andreas Rühlow is strongly influenced by street art. 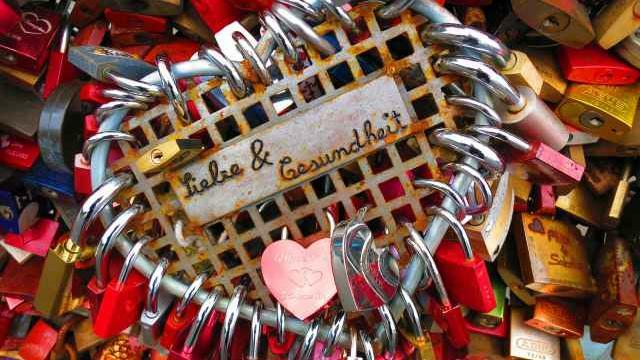 If you will, Cologne’s Love Lock Bridge is one special piece of street art or urban art - created by thousands and thousands of artists. Certainly the biggest piece of art in Cologne or even in Germany - one of those things where the whole is definetly more than the sum of its parts. 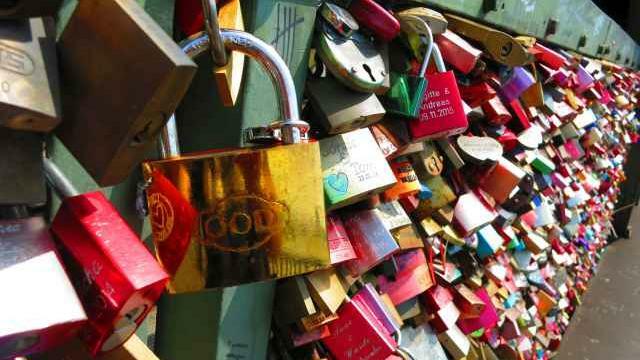 Each love padlock symbolizes the love of two persons, and it is telling its own individual story of proximity, affection, longing, pain, dispute and concillation. On the other hand, the bridge as a whole can tell its own story. 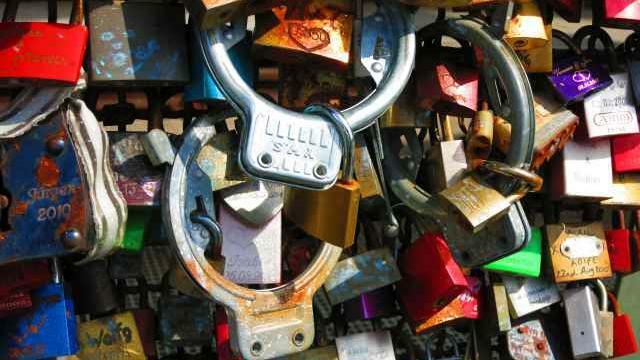 About people who arrive, attach their packlocks to the bridge, and transfer their love back into their lives, leaving back a mosaic of multiple colors and forms. 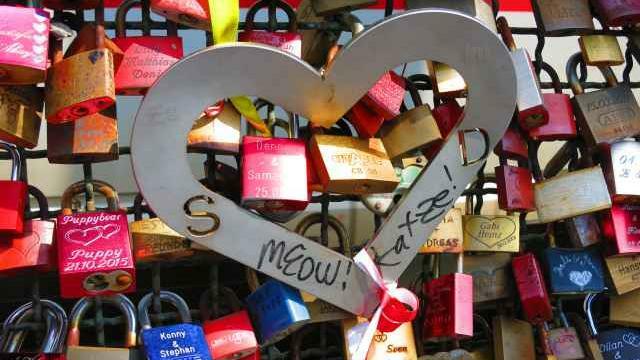 The small and bigger padlocks, plaques, signs and handwritten declarations of love form an image of love on a higher level - based on the romantic idea of love and common values which unite all loving couples and visitors of the bridge. The picture of the bridge as a whole on this website demonstrates the hugeness of this unity. 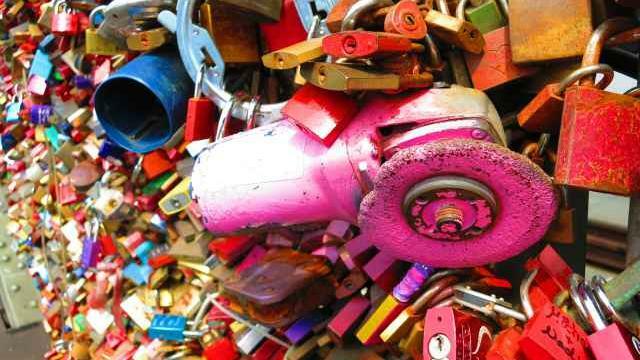 At the same time you will get the chance to zoom into the picture and study every single padlock. 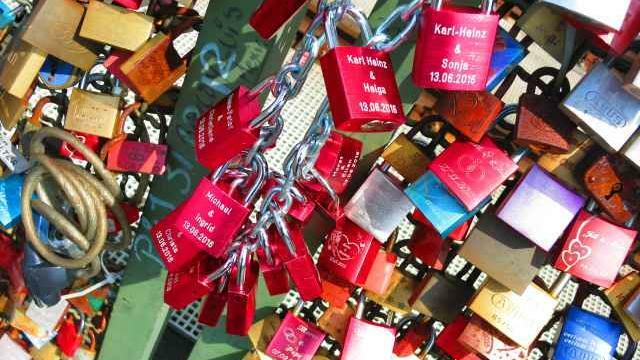 As a couple you might recover the padlock you have once physically attached to the bridge - even if in the meantime, you have travelled back to Frankfurt, Vienna or Vancouver. 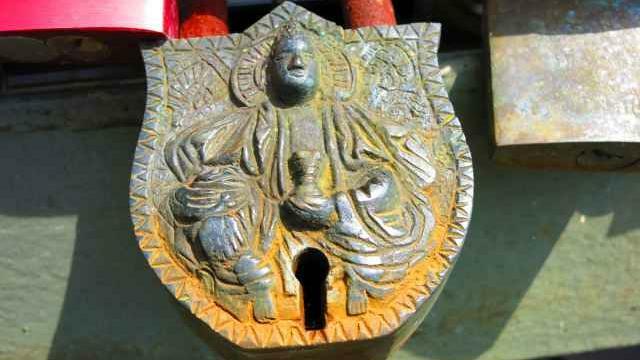 However, every visitor of this site might find his own personal spot and attach his love in form of a virtual lock.